On a wet and soggy Saturday morning in Schenley Park, Pitt’s men’s and women’s cross country teams competed in their first races of the year, overcoming the subpar conditions to finish in the top two at the annual Duquesne Duals. 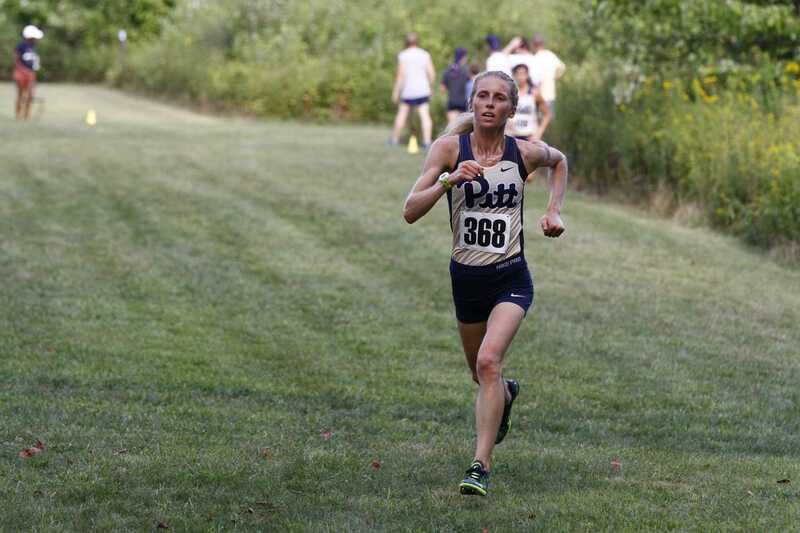 The women’s team won the 5k race handily, beating second-place Duquesne by nine points. The men came in second in the 8k competition, despite having the first and second individual finishers. Senior Kelly Hayes finished first overall for the women — finishing with a time of 17:58.9 — quickly followed by junior Miranda Salvo and senior Amy Kelly, who finished second and fourth, respectively. Rounding out the top five were junior Makenzie Zeh, who finished sixth with a time of 18:36.2, and senior Emily Loeffelholz, who came in 11th at 19:03.5. Women’s coach Adam Bray was also pleased with the team’s performance, pointing to Hayes and Salvo as runners who impressed him. The men also had several top finishers at the event, with four runners finishing inside the top 10. Sophomore Jackson Morton won with a time of 26:08.7, beating out junior teammate Sebastian Curtin by just three seconds. Junior Nate Sloan was the next Panther to come across the line, placing ninth, while freshman Zach Lefever and senior Billy Caldwell finished 10th and 17th, respectively. Still, the team couldn’t manage to win the event, coming in second behind Duquesne. The gap between Lefever and Caldwell was what ultimately led to the loss, with two Duquesne runners placing in between the Panthers’ pair. Coach Bryan Jackson was pleased with how his athletes raced though, expressing optimism about his athletes’ futures. The weather was the biggest challenge for the Panthers’ runners Saturday morning. Rain pelted the course for up to an hour prior to the start of the women’s race, making the ground wet and muddy. But both the men’s and women’s runners said they had no problem with it, even though it might have affected their competition. Hayes went even further, saying she enjoys running and competing in these conditions. Next weekend, the women’s team travels to Penn State to take part in the Harry Groves Spiked Shoe Invitational Sept. 8. Meanwhile, the men’s team has on off week before heading to Buffalo, New York to compete in the UB Stampede Invitational Sept. 15. Both coaches sat out several of their best athletes this week — most notably junior Gillian Schriever and sophomore Nick Wolk — adding to their confidence going forward.